Drivers on Orange County roads face a unique set of challenges. In this decentralized suburban county, cars are a necessary part of everyday life, and this lifestyle comes with its own set of risks. Across the country, California drivers are infamous for their rough-and-ready attitude towards driving, and Orange County drivers are no exception. As any street-smart California driver can tell you, speed limits are enforced (and followed) inconsistently at best. The roads themselves are often filled with hazards such as potholes and wear from over-driving. During the rare rain storm, they are slick from a combination of rain and oil built up from months of dry weather — which is compounded by the fact that some Southern California drivers are unaccustomed to driving in the rain. To top it all off, the daily commute in Southern California can be stressful, leading to short tempers and regrettable physical confrontations fueled by road rage. Whenever you get behind the wheel, you are taking a calculated risk. 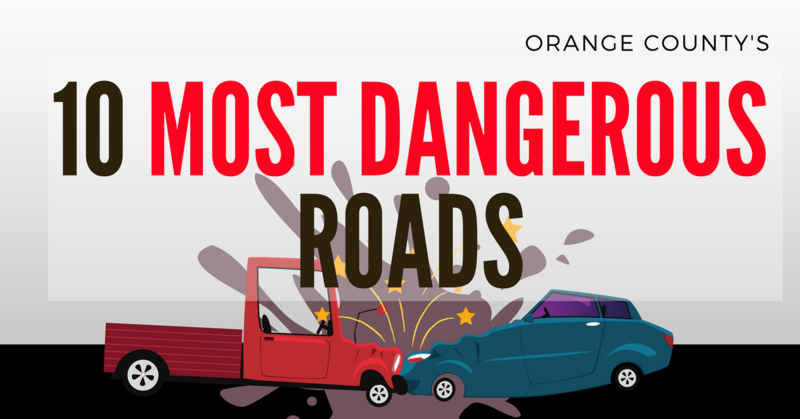 That said, some roads are riskier than others, and we have compiled a list of some of the most dangerous roads and intersections in Orange County, so drivers there can plan their trips forewarned of possible hazards. Laguna Canyon Road is a strip of State Route 133 which cuts through the beautiful Laguna Canyon just south of Irvine. It’s in the middle of Orange County, in an area surrounded by development, and yet it’s in one of the few true wilderness areas left in the county. But with that beauty comes danger. 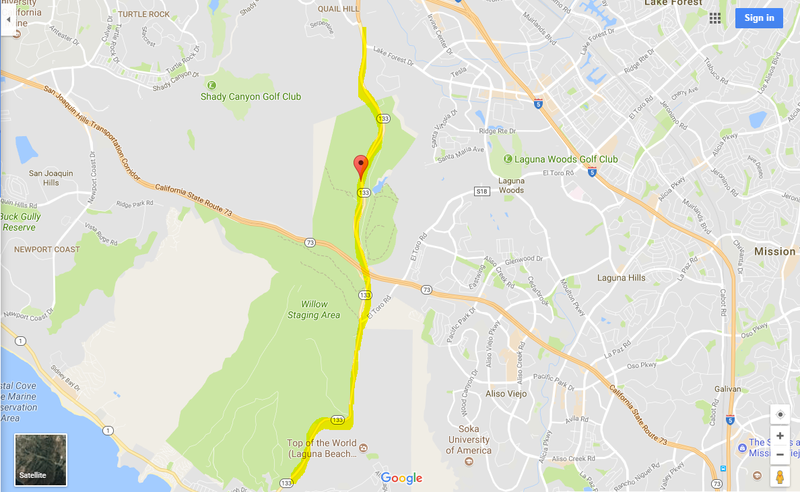 Laguna Canyon Road has long been known as one of the most dangerous roads in Orange County, particularly at night when visibility is poor, and drunk drivers are relatively common on the road. 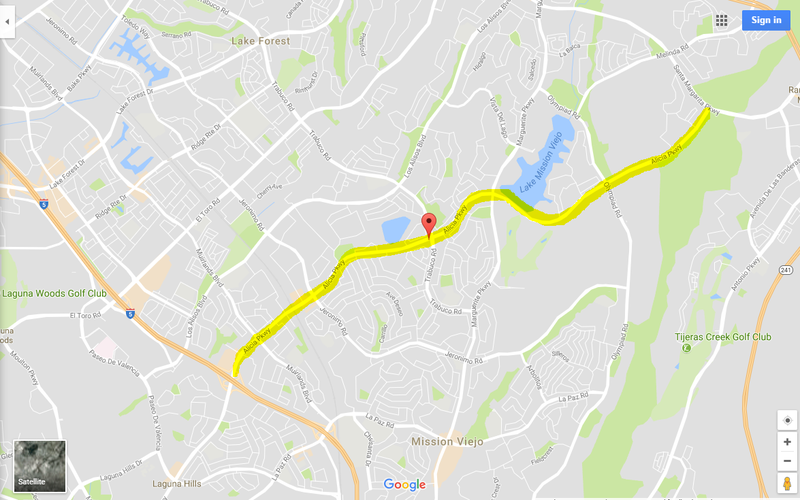 Alternative Routes: Fortunately, Laguna Canyon Road is not particularly central, and drivers can easily avoid it if they wish. To get from the inland part of Irvine to the coast, consider taking Irvine Center Drive/Moulton Parkway or Jeffrey Road/University Drive to Jamboree Road, and try hopping on the 405 if you’re not near either of these roads. 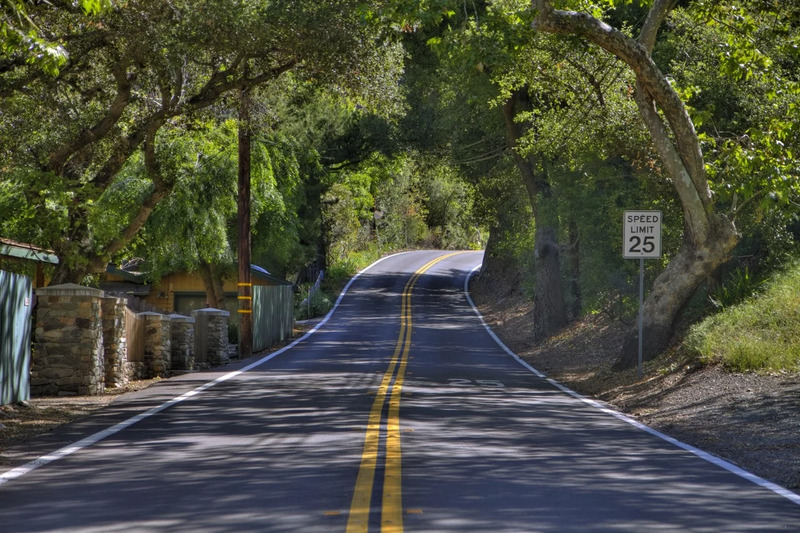 Another beautiful but deadly road, Ortega Highway, is known as State Route 74. It stretches across a wild region of South Orange County, from Interstate 5 in San Juan Capistrano all the way to Riverside County. 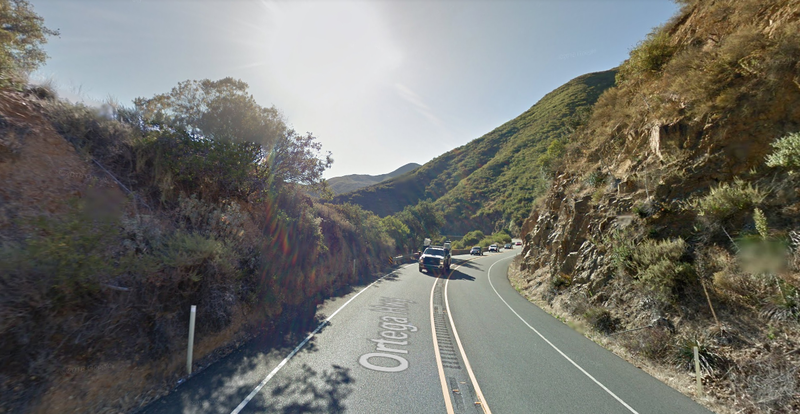 The Ortega Highway is a narrow and steeply winding road. It is famous for being a particular magnet for motorcycle accidents. Motorcyclists often see the road as a fun challenge, but every year, dozens of motorcyclists are killed or injured on Ortega Highway. 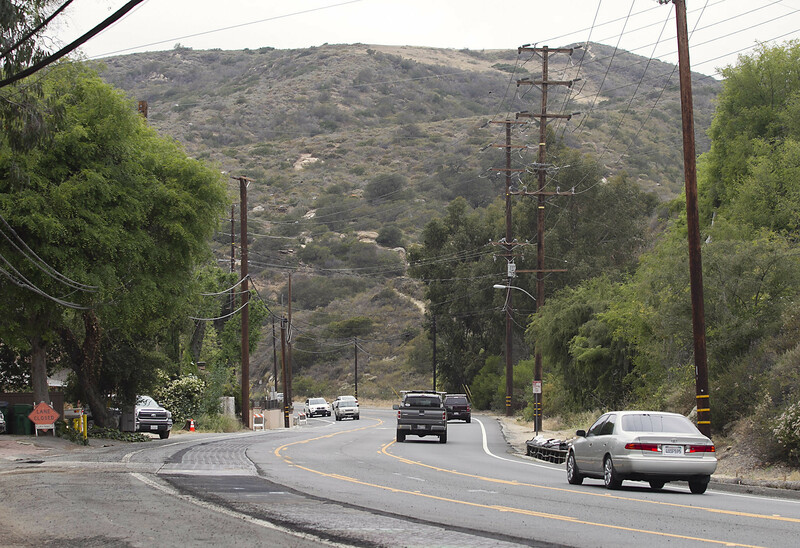 Alternative Routes: To steer clear of Ortega Highway, you must take a more northerly route. Go up to central Orange County and take the 241 or the 55 to the 91, and then take Interstate 15 or 215 south to the area where Ortega ends. Like the first two roads, Santiago Canyon Road is in one of the more secluded parts of Orange County. The road snakes around behind Limestone Canyon Regional Park, stretching from the Trabuco Canyon area to Orange, where it turns into East Chapman Avenue. For residents of Silverado, the rustic out-of-the-way town in eastern Orange County, Santiago Canyon Road is the only pathway to the rest of Orange County. However,a 1997 article in the Los Angeles Times labeled Santiago Canyon Road the “road of death.” As with Ortega Highway, motorcyclists are particularly prone to danger. Alternative Routes: The good news is that most people traveling across Orange County can easily avoid Santiago Canyon Road. California State Route 251 runs parallel to Santiago Canyon Road. Although Route 251 is a toll road, a few dollars is a small enough price to pay for a safe trip. For those interested in going a little further out of the way, Trabuco Road/Irvine Boulevard is also a good option. The bad news is that residents of Silverado don’t have options. Santiago Canyon Road is the only direct route to the rest of Orange County; the only other routes back to civilization involve going far out of the way. So if you are planning to live or work in Silverado, take this important traffic safety concern into account. Beach Boulevard runs along a part of State Route 39, which begins at the coastline in Huntington Beach and continues northward through Orange County, terminating in Los Angeles County. It is a busy thoroughfare connecting several of the major downtown areas of northern Orange County. The worst parts of Beach Boulevard, however, are three particular intersections in Stanton. 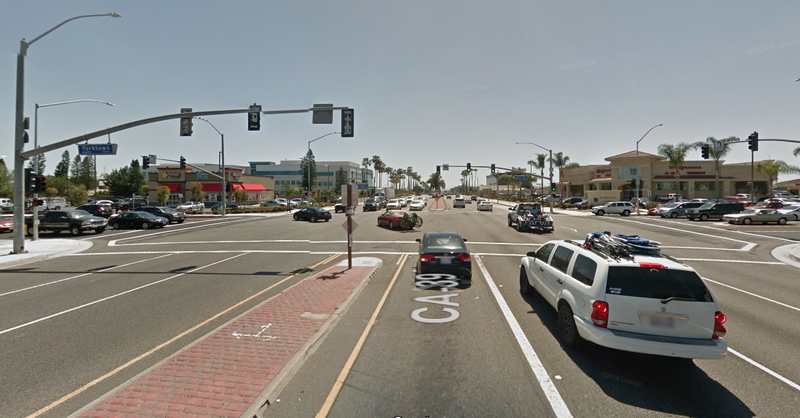 The intersection of Beach Boulevard and Chapman Avenue was, for the year preceding October 2015, the most dangerous intersection in Orange County, with 15 collisions. The intersections with Lampson Avenue and Garden Grove Boulevard had 12 and 7 collisions, respectively. Alternative Routes: Fortunately, most of the area around Beach Boulevard in Stanton is a grid, so you don’t have to go too far out of your way to avoid Beach Boulevard. Try taking Western Avenue, which is a block to the west, or South Dale Avenue, which is a block to the east. Alicia Parkway is another long and winding road in south Orange County. It starts at Crown Valley Parkway in Laguna Niguel (see below), and continues for several miles before terminating at Santa Margarita Parkway in Rancho Santa Margarita. However, statistics show that the most dangerous part of Alicia Parkway is in Mission Viejo. The four intersections at Jeronimo Road, Muirlands Boulevard, Charlinda Drive, and Route 5 were all hot spots for collisions. Jeronimo Road was the worst, with 11 collisions in the year before October 2015, and Muirlands Boulevard was the second worst, with 9 collisions. The other two roads had six collisions each. The intersection with Olympiad Road has also been noted as being troublesome. Alternative Routes: Alicia Parkway can be hard to avoid, because it passes through such a wide swath of land, and few roads run directly parallel. 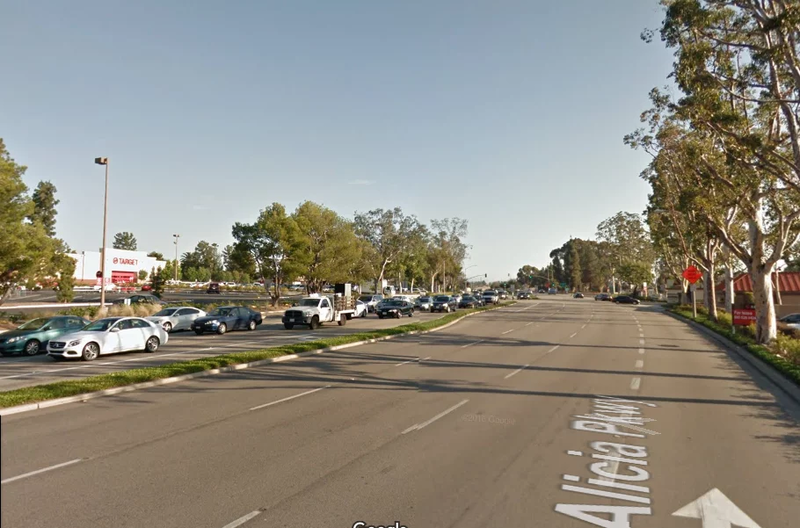 The closest road to run parallel to Alicia Parkway in the dangerous Mission Viejo section is Los Alisos Boulevard. Crown Valley Parkway is found not far from Alicia Parkway. It spans a long distance in southern Orange County, starting at Pacific Coast Highway and making its way all the way through Laguna Niguel and Mission Viejo until it intersects with Antonio Parkway in Ladera Ranch. There are a few major trouble spots on Crown Valley Parkway. One of them is the intersection with Cabot Road in Laguna Niguel, where eight major collisions occurred in the year before October 2015. 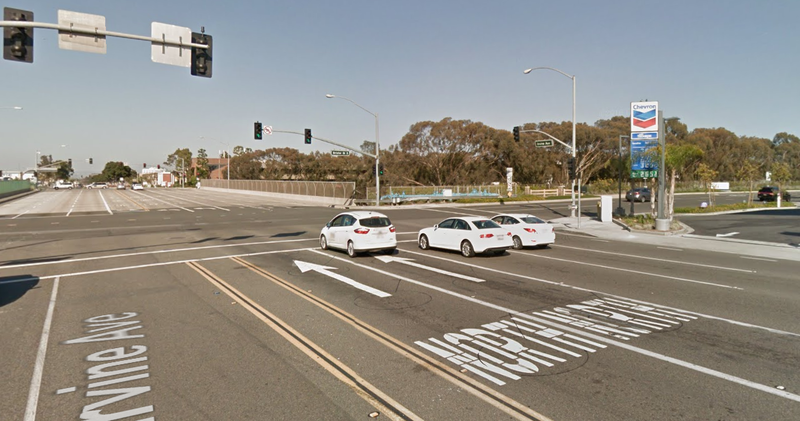 The other dangerous intersections are in Mission Viejo: at Marguerite Parkway and Puerta Real, where eight and six collisions occurred, respectively, during the same time period. Alternative Routes: To avoid Crown Valley Parkway, your options are limited. In most of the dangerous areas, there are no easy alternative routes, which is perhaps why collisions are so common. To avoid the intersection with Cabot Road, for instance, you could take Paseo de Colinas, but if you continue in the same direction as Crown Valley, this will take you to Marguerite Parkway, which will put you back in the path of one of the problem intersections. Avoid the area if you can, but if not, drive carefully and be wary of your surroundings. El Toro Road, which shares a name with the former Marine base (now the Orange County Great Park) and residential community (now incorporated into Lake Forest), starts at the above mentioned State Route 133, and continues on into Lake Forest before splitting into Live Oak Canyon Road and Santiago Canyon Road (also mentioned above). Sandwiched in between two infamously dangerous roads, it should come as no surprise that El Toro Road also has frequent car accidents. One danger spot is at the intersection with Trabuco Canyon Road, where six collisions happened in the year before October 2015. Another risky spot is at the intersection with Montcliff Drive, a much smaller residential road. Between 2008 and 2012, six people were injured at this intersection, four seriously. Although Montcliff Drive is controlled by a stop sign, locals say that many drivers speed downhill to El Toro Road and disregard the stop sign. Alternative Routes: Fortunately, the two dangerous intersections are right next to each other. This makes the area fairly easy to avoid. For a road parallel to El Toro Road, consider taking Lake Forest Drive or Los Alisos Boulevard, and for a north/south route that crosses El Toro Road but bypasses the danger zone, try taking Jeronimo Road (but, as we mentioned, be careful of the intersection with Alicia Parkway a couple of blocks further south). For our eighth dangerous road, we go back to the central Orange County area. Bristol Street starts at Jamboree Road in Newport Beach, curves, and heads north into Santa Ana. Like the above mentioned Beach Boulevard, this is a busy street which goes right through the heart of a crowded urban area. One area of concern on Bristol Street is the intersection with Campus Drive in Newport Beach. 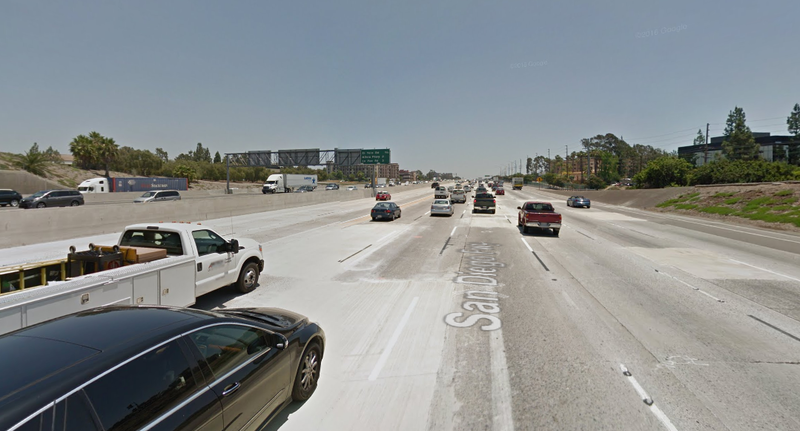 In this area, which is near an exit to the 73 freeway, drivers are known to speed as they get off the freeway. Drivers in this area, where one person was killed and five others injured in the period between 2008 and 2012, are also known to fail to yield the left turn at red lights, so if you’re in this area, drive carefully! The other dangerous intersection was further north, at McFadden Avenue in Santa Ana. This intersection is close to Martin Luther King Jr. Elementary School, and is known for pedestrian accidents. If you drive through this intersection, particularly at the beginning or end of the school day, you be on your guard for pedestrians, especially small children. Alternative Routes: Because it is in such a well-developed part of the county, the area around Bristol Street is particularly easy to circumvent. To avoid the area around Campus and the dangerous 73 interchange, consider taking Santa Ana Avenue/Red Hill Avenue or Jamboree Road. To avoid McFadden Avenue, try Edinger Avenue or Bishop/Willits Street. It shouldn’t be surprising to see Chapman Avenue on this list, seeing as it is a continuation of Santiago Canyon Road, which took the Number 3 spot. It turns out that, even once you get out of the canyon, this strip of road – which heads west from Santiago Canyon through Orange and Anaheim, all the way to Garden Grove, and passes a few blocks below Disneyland – is still a hotbed of collisions. One of the dangerous intersections – the one located at Chapman and Beach Boulevard – we already covered above. But as this was recorded as the most dangerous intersection in Orange County, it bears repeating. 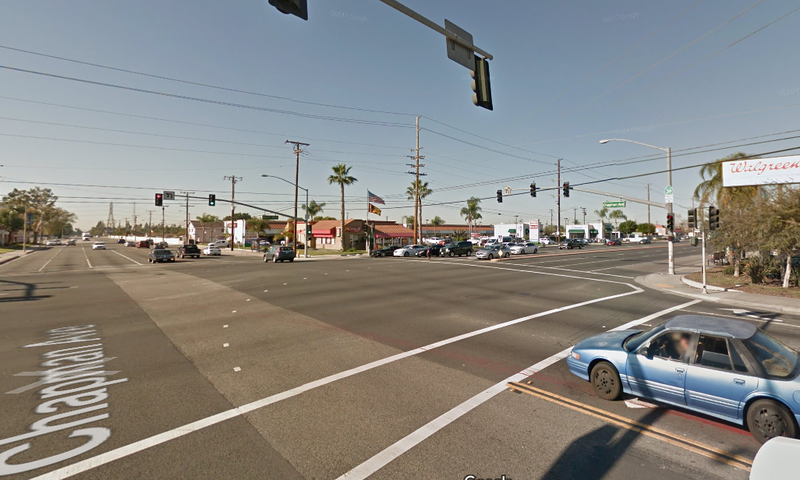 And there is another dangerous spot on Chapman: the intersection at Gilbert Street in Garden Grove, where one person was killed and five more injured between 2008 and 2012. Alternative Routes: Chapman Avenue might be difficult to avoid because even though it’s part of a grid, the two streets to the south – Lampson Avenue and Garden Grove Boulevard – have their own deadly intersections. So instead, drivers who want to steer clear of Chapman should go one block north, to Orangewood Avenue, or two blocks north, to Katella Avenue. These roads break in multiple places, though, so plan your trip ahead! Interstate 5 cuts right through the middle of Orange County, and then goes on to stretch the length of the entire state of California, as well as Oregon and Washington, from Canada to Mexico (and even continues into those countries under different names). In Orange County, there are a few danger spots on Interstate 5, including the notoriously complicated “El Toro Y,” where the 405 merges with the 5. However, the two sections of the 5 we would like to highlight are the interchanges with Alicia Parkway (mentioned above) and Avenida Pico in San Clemente. At both of these intersections together, a sum of 13 collisions occurred in the year before October 2015. Alternative Routes: If you want to live in Orange County and avoid Interstate 5, best of luck! You’ll have to go pretty far out of your way. But to avoid the Alicia Parkway exit, try getting off at Cabot Road or El Toro Road, and to avoid Avenida Pico, consider exiting at Avenida Vista Hermosa or El Camino Real. This is not by any means an exhaustive list. It’s important to remember that any road, no matter how well-designed, can be dangerous when people do not drive safely. Accidents can happen anywhere; drive with caution, armed with information about alternative routes you can take to avoid the worst spots.